This model is discontinued. 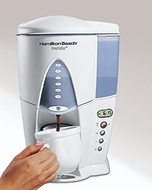 As an alternative, we recommend the Hamilton Beach 47224 BrewStation Coffeemaker. With sleek contemporary styling and an enclosed brewing system, this 12-cup coffeemaker brews directly into a double-wall thermal-insulated tank with a gentle warming heater instead of into a traditional carafe. Since there's no scorching hot plate, coffee stays fresh longer, maintaining its full flavor. With this appliance, there's no messy glass carafe to hassle with. Push-button dispensing for one cup of coffee at a time provides exceptional convenience, and brewing is as simple as ever - just add water, a standard filter, and coffee. Size: approx. 11" x 10" x 14"